Bela Lugosi, David Manners, Helen Chandler, Dwight Frye, Edward Van Sloan, Herbert Bunston, Frances Dade, Charles Gerrard, Joan Standing, Moon Carroll, Josephine Velez, Michael Visarofh, Daisy Belmore. Experience this timeless classic brought to life in this Digitally Enhanced and Remastered Edition, Scored for the first time in 68 years with New Music by Philip Glass, Performed by Kronos Quartet. 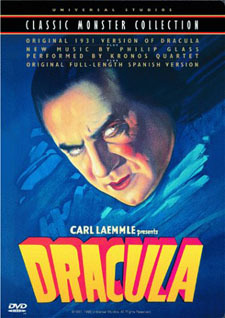 Although there have been numerous screen versions of Bram Stoker’s classic tale, none is more enduring than this 1931 original. Towering ominously among the shadows of the Carpathian Mountains, Castle Dracula strikes fear into the hearts of the Transylvanian villagers below. Bela Lugosi, starring as the screen’s most popular vampire Count Dracula, together with horror specialist Director Tod Browning, create the film’s eerie and chilling mood. Dracula remains a masterpiece not only of the genre, but for all time. Producer: Carl Laemmle Jr. Director: Tod Browning. Screenwriter: Garrett Fort based on the novel by Bram Stoker. and on the play by Hamilton Deane and John Balderston. Editor: Milton Carruth, Maurice Pivar. Cinematographer: Karl Freund. Art design: Charles D. Hall. Original music by Philip Glass (new score 1999).